The Villages, Florida United States - GOLF COURSE VIEW IN-GROUND HOT TUB LOVELY COURTYARD THE VILLAGES FL | RE/MAX PREMIER REALTY Inc.
Lovely two bedroom courtyard villa with a den! King in the master, flat screen TV in the master, large walk in closet, etched glass shower! Guest room has a queen bed. Carpet in guest room and den. Flat screen in the living area with new furniture! Tile flooring in living area. Washer and dryer inside the utility room with utility sink. Two solar tube in the home. Open floor plan with plenty of room for cooking and entertaining. Kitchen has plenty of cabinets and granite counter tops, tile back splash, newer stainless appliances, completed furnished, bring clubs and clothes. This home has a large nice birdcage with an in ground hot tub. The view of the golf course from any direction is just beautiful! Low maintenance landscaping. One car garage with an electric screen door and painted garage floor, room for a golf cart. 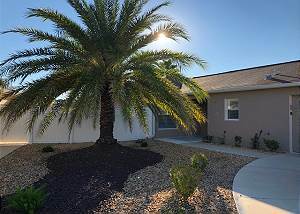 Great location in Duval in the villas of Allandale! Pet friendly! Non smoking. You are surrounded by golf courses, recreation center and right in between Lake Sumter Landing and Brownwood Paddock Square.